Although the actual move of Headmagnet from the old server to the new server will be very short, some users may find that the "headmagnet.com" web address will still point to the old server rather than the new server. It may take up to 24 hours for some internet service providers to recognize the change. After the move, users whose internet service providers are still pointing to the old server will see a instruction page with a link for a temporary alternate web address for the new server. Note: Facebook connect will not work via the alternate temporary address, so please make sure you set up an email/password login if you have not done so yet. Filter lists by tag: This allows you to show only the lists that have a certain tag, and perform actions upon just those tagged lists. 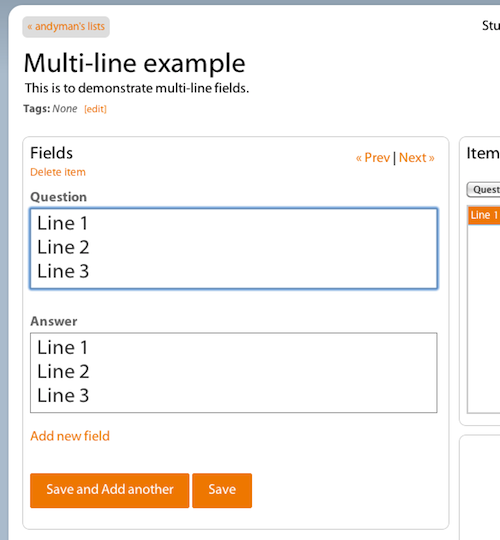 This lets you organize your lists into your own custom groups or subjects using the tags, and study just those lists. Filter lists by permissions: See just the lists that you have set to a public, friends-only, or private. Sort lists: Sort by newest first, title, permissions, most items, most users, and date last modified. Head toggle: Now you can quickly toggle whether a list or its study modes are in your head by clicking the head toggle icon next to a list or study mode. When a list is deleted, it will be removed from the heads of all the users who had it in their head. Keep in mind that when a list is restored from the Deleted Lists section, it does not automatically get added back to those users' heads. Deleted Modes: When an individual study mode is deleted, it is simply deleted. It doesn't go to the trash. It can't be restored. Headmagnet Pro is an account upgrade for power users, serious students who want to study even smarter, and teachers who want to be able to do even more with their study lists. No more ads: With a pro account, there are no more ads to slow down your studying experience! Pro badge: Let others know that you're helping to fund additional new improvents to Headmagnet. It only costs about $2/month for a 1-year Headmagnet Pro upgrade. How much is the time savings and convenience worth to you? Upgrade now. You can now use shift-return key combination to add a new line within a field when adding/editing items in your study lists. Tip: In Headmagnet, the default behavior of the return button when editing items is to go to the next field or next item (if you are on the last field), since most users typically enter very short 1-line questions or answers for their items. This allows you to quickly add items without having to take your hands off the keyboard or press the tab key. Just make sure the first row contains the field names. 1. 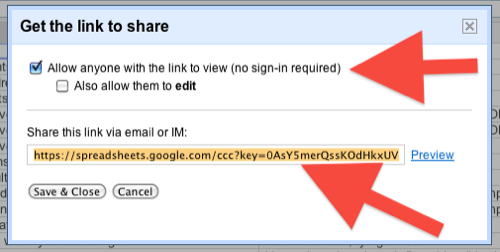 Create the spreadsheet in Google Docs and click the "Share" button. 2. 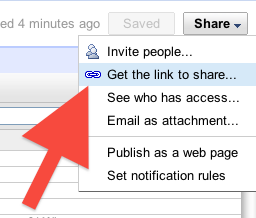 Select the "Get the link to share" option. 3. Check off the "Allow anyone with the link to view" checkbox, copy the full link for the spreadsheet, and click the "Save & Close" button. 4. 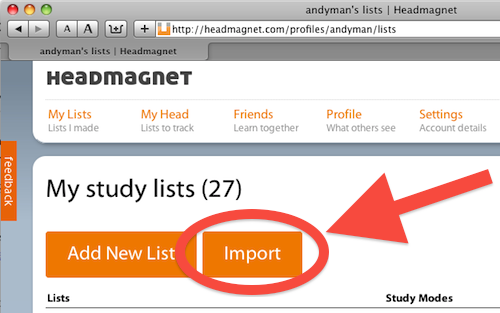 Now sign into Headmagnet, and click the big orange "Import" button on your "My Lists" page. 5. 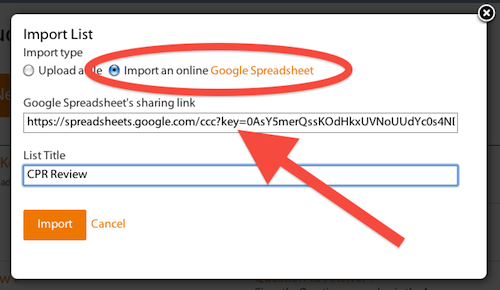 Select the "Import an online Google Spreadsheet" option, paste in the link, enter a title for the list, and click the "Import" button. 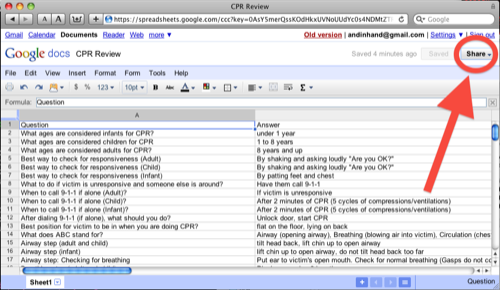 You can now import external study lists into Headmagnet via CSV (comma-separated values) or tab-delimited files. The first row of the CSV or tab-delimited file should be the names of the item fields.